This store will open outside these hours on request for bookings or parties consisting of fifteen painters or more. Plaster Model from our small range. This is a DIY Party, we do not provide any host, cleaning, games, food or time management. So please be aware you will have to do this yourself. Scouts/Girl Guides, Christmas Functions, Adult Parties, Hens Nights, Large Groups. Minimum 15 people. 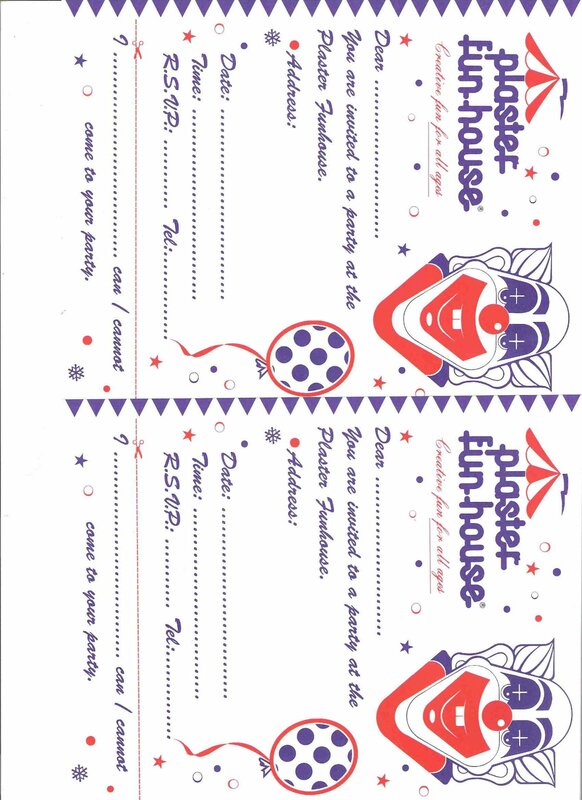 PRINT YOUR PARTY INVITES HERE!! YOU MUST BOOK YOUR PARTY AT OUR STORE AND RECEIVE CONFIRMATION PRIOR TO HANDING OUT INVITES. SO WE CANNOT GUARANTEE TO GIVE YOU THE TIME YOU WANT. TO PRINT THE FILE, RIGHT CLICK PARTY INVITES BELOW AND SAVE FILE TO YOUR COMPUTER, THEN PRINT DIRECTLY FROM YOUR COMPUTER.